Why Have Five Intel Engineers Turned Up in Jordan? 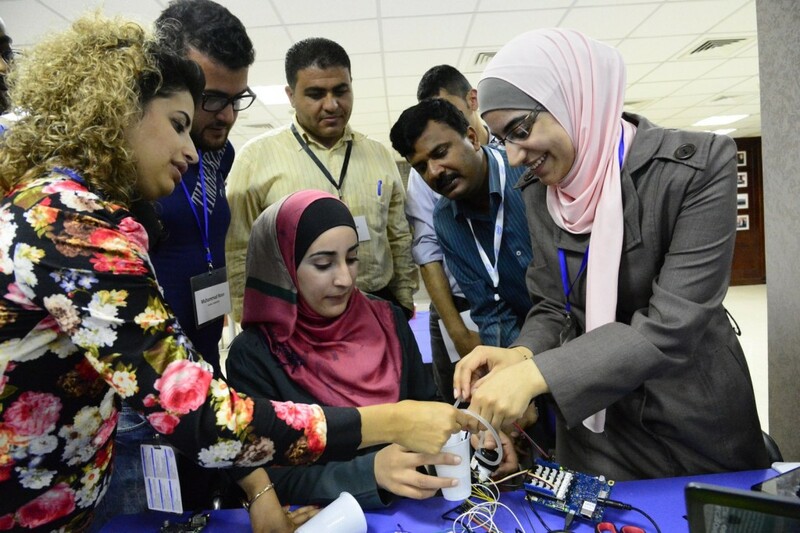 Computer engineering graduates Arwa Tarawneh (left) and Suha Habashneh are learning how to work with Intel Galileo. 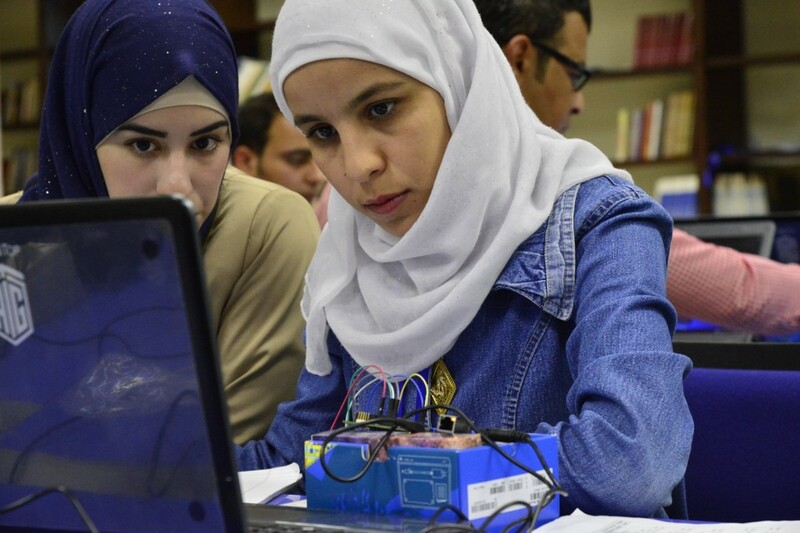 Two young Jordanian women, Arwa Tarawneh and Suha Habashneh, are hunched over a laptop hooked up to a tiny circuit board sprouting multicolored wires and flashing red and green LEDs. While such a scene should not be surprising for these two computer engineering graduates of Jordan’s Mutah University, what’s notable is that they both traveled three hours through the Jordanian desert by bus from their hometown of Karak that morning to get to the lab in Amman. Raed Aqeil, a professor of electrical engineering at Yarmouk University, brought six of his top students to work with the Intel team. 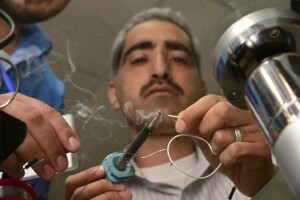 Here he solders together a simple copper-strip sensor he is creating to measure galvanic skin response, or GSR. In a moment he’ll connect his new sensor to a Galileo board. GSR has health-care applications. Tarawneh and Habashneh planned to make the six-hour round trip every day for two weeks to learn how to program on the Intel Galileo, an inexpensive but flexible Arduino-compatible Intel Quark SoC-based development board. In the hands of students, tinkerers and makers, Intel Galileo can be the brains inside small devices such as robots, health care monitors, soil sensors, solar panel monitors, traffic controls, home automation systems, security devices, and even drones. Why? Simply “to get this chance,” Habashneh answered in Arabic through an interpreter. She wants to launch a software startup, while Tarawneh would like to teach other young people how to program small machines like the Galileo board. Both of them, along with over 70 other young men and women, were taking part in a two-week-long workshop at Talal Abu-Ghazaleh University put on by the Intel Education Service Corps (IESC), a program that sends Intel employees all over the world to work with children, educators and communities. The IESC has launched programs in developing countries such as Kenya, Costa Rica, Nepal, the Philippines, among others, to enhance education efforts and kick-start technology projects—all aimed at bringing the benefits of technology to people in the developing world. One of the technology projects that the Jordanian engineering students worked on was a prototype “auto-garden.” The Intel team gave students paper cups filled with dirt they scooped up from outdoors. Using a Galileo board wired up with a small pump and a moisture sensor—and of course the right program they wrote—the students created working mini-systems to water the soil at exactly the right time. In arid Amman, average annual rainfall is just 11 inches. 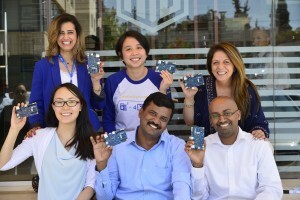 Intel Education Service Corps in Amman, Jordan. Front row, left to right: Qiujie, Bhaskar Nagaraja, Tesfu Solomon, IESC team leader. Back row: Doa’a Al-Otoom, Lauren Lieu. Rula Habash, at far right, works for Intel, is based in Amman, and helped set up the IESC team’s project. The team members are holding Intel Galileo Development Boards, which are Arduino-compatible and support Linux. It costs around $70. With the help of the Intel team, students of the program learned how to make remote-control robots, solar tracking arrays, automatic watering systems, fire detecting devices, technology to help the blind, and more. One of the five Intel engineers participating is Doa’a Al-Otoom, a computer engineer and scientist at Intel Oregon, who is also a native of Jordan. Al-Otoom grew up in a rural village, and she says that working with her fellow Jordanians triggered something within her. “I want to have a big impact,” she said, and help young Jordanians who, like she admitted she once did, see limited opportunities for a career. Al-Otoom says she can see the fruits of her labor almost immediately. Other Intel employees are now inspired to lend a helping hand to their homelands. Tesfu Solomon, an Oregon-based engineer with a Ph.D. in chemical engineering, said he would like someday to return to his native Ethiopia and—perhaps on his upcoming Intel sabbatical—teach a technology course for young people in Ethiopia similar to the one he’s been overseeing in Jordan. 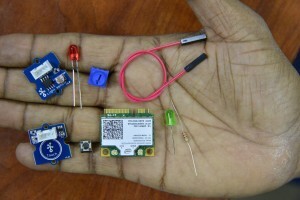 Intel Galileo can be wired to a wide range of peripheral devices. Top row, from left: light sensor, red LED, potentiometer, jumper wire. Second row: touch sensor, pushbutton, WiFi card, green LED, and resistor. Other peripherals can include LCD displays, sound sensors, light sensors, heat sensors, servo motors, buzzers, heart rate sensors, GPS units, and much more. In earlier generations—and for a host of complex reasons—many people who immigrated to the U.S. cut all ties to their homelands. Wartime refugees, in particular, often had no interest whatsoever in looking back. Intel icon Andy Grove, for example, fled Hungary in 1956 and to this day has never again set foot in his homeland. Today, the Intel people see nothing but opportunity in going home, at least for a bit.